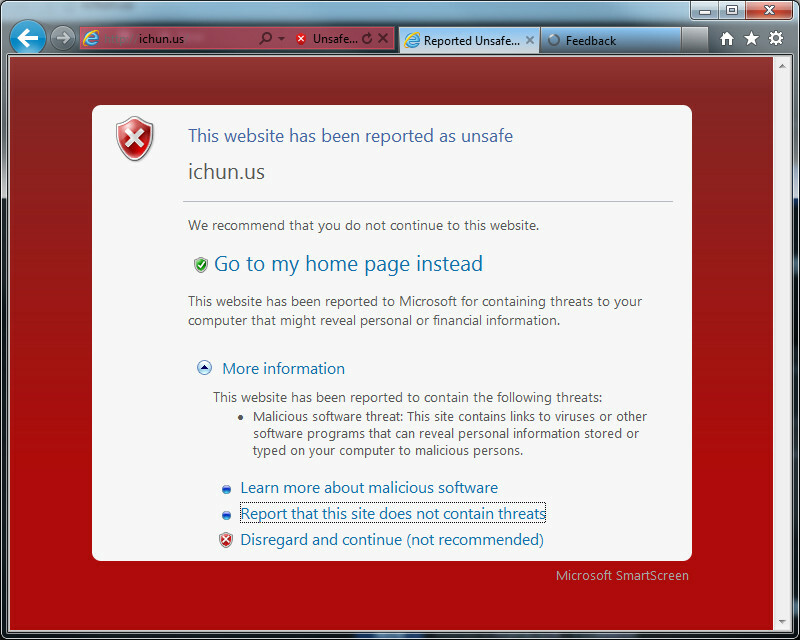 iChun's blog » “Malicious Content” warning. LIES! ALL LIES! “Malicious Content” warning. LIES! ALL LIES! Guys, I’ve been getting reports that Microsoft SmartScreen has been blocking this website due to “malicious content” or so. You’d be getting a picture like this. I can reassure you that there are NO malicious threats with this web site. Everything has been checked and verified clean. Even our ad hosters are by GOOGLE, so if Microsoft think’s Google ads are viruses, or that minecraft mods are dangerous, I am disappointed. You guys can do me a favour by submitting a report that you think the site is safe, here. Or you can do the world a favour by NOT using IE. I would recommend Google Chrome, or FireFox. the only thing malicious is the file im downloading right now. WAIT. Noooooo. Why do you use Internet explorer in the first place? Just a heads up – it isn’t Microsoft. Your site has been blacklisted with several popular anti-virus software packages. For example, ESET antivirus has you on their perminanent URL blacklist. I assume that Symantec and McAffee do as well, or are about to, as they all share similar black lists.